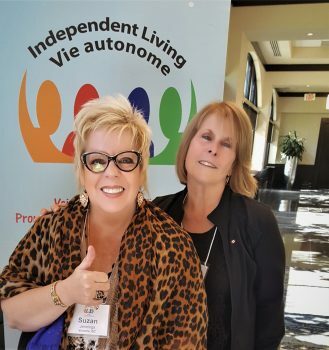 In September the Victoria Disability Resource Centre (VDRC) sent two representatives, board member Suzan Jennings and office manager Neil Dickie, to attend the annual national conference of our parent organization Independent Living Canada (IL Canada) in Ottawa. Disability resource centres from across Canada attended, including four from BC (Victoria, Duncan, Richmond, and Vernon). The conference included the announcement of key initiatives that will be undertaken by IL Canada this year, including, increased public education about the Government of Canada’s Disability Tax Credit, which many entitled Canadians with disabilities do not as yet receive. This tax credit not only provides a tax deduction of over $8000 per year (more for those under 18), but also opens up the possibility of generous government grants—with no investment required on the part of the recipient—thro the Registered Disability Savings Plan (RDSP). In BC, get information of the Disability Tax Credit here or phone 1-844-311-7526. Volunteers: how to attract and keep them? Explain the importance of volunteers in the delivery of programs and services. “Think FRIEND-raising, not FUND-raising”: More and more non-profits are finding that the best kind of fund-raising event is one that is organized NOT by centre staff, who are usually stretched thin with multiple responsibilities as it is—but by a friends of the disability resource centre, such as a for-profit organization seeking to do community service. “Paint Nights” are popular: three Disability resource centres reported this as their most successful workshop/recreational event as reported by 3 DRC’s (disability resource centres). Close second: movie nights. The most important thing in motivating and keeping volunteers: understand that most volunteers contribute their time mostly because they believe in the goals of the organization. You best motivate them by clearly articulating the goals of the organization, and then structuring work so that volunteers feel they are directly contributing to these goals. Regularly inform volunteers of the impact of their work on the organization and the people it serves. At the same time, recognition of volunteers is also regarded as an essential practice.